Outstanding Actor for Van Hansis, and Supporting Actor for Stephen Guarino and John Halbach. Los Angeles, CA (March 21, 2018) – The National Academy of Television Arts and Sciences has announced nominations for the 45th Annual Daytime Emmy Awards and Kit Williamson’s acclaimed LGBT series EastSiders was included in 6 categories, including Outstanding Daytime Digital Drama Series and Outstanding Writing and Directing for Kit Williamson. Called “Funny and Heartbreaking” by Entertainment Weekly, all three seasons of the critically acclaimed LGBT series are now streaming on Netflix worldwide, and are available on DVD and VOD through Wolfe Video. The 45th Annual Daytime Emmy Awards will take place April 29, 2018. 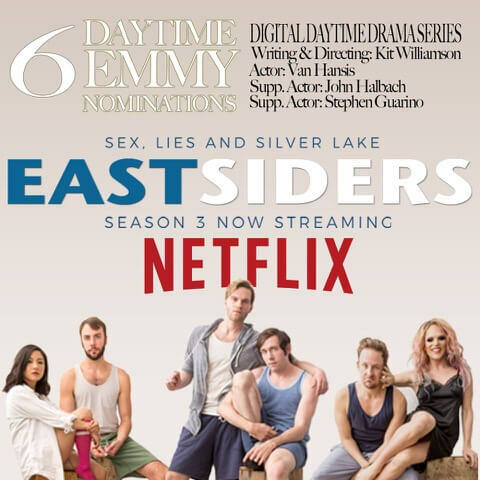 EastSiders also received an Outstanding Actor in a Digital Daytime Drama Series nomination for Van Hansis and Supporting Actor nominations for Stephen Guarino and John Halbach. This marks Hansis’ fifth Daytime Emmy nomination, having received a nomination for his role as Thom in season two of EastSiders and three nominations for playing the role of Luke Snyder on As The World Turns (a role that made history in 2007 by being daytime television’s first kiss between two men). Other accolades for EastSiders include two previous Daytime Emmy Nominations, a Satellite Award Nomination from The International Press Academy, two Indie Series Awards for Best Ensemble, the Queerty Award for Best Digital Series, and the LA Weekly Web Award for Best Drama. Executive produced by Williamson and his husband John Halbach, season three of EastSiders follows the cross-country misadventures of Cal (Williamson) and Thom (Hansis). It was shot on location in New York, New Jersey, Pennsylvania, Ohio, Indiana, Illinois, Minnesota, Wisconsin, Iowa, South Dakota, Wyoming, Montana, Idaho, Oregon, Nevada and California and features guest appearances from Constance Wu (ABC’s Fresh Off The Boat), Wilson Cruz (Star Trek Discovery), Tuc Watkins (Desperate Housewives, the upcoming Broadway revival of Boys in the Band), Brianna Brown (The CW’s Dynasty), Matthew McKelligon (You’re Killing Me), Colby Keller (High Maintenance), Stephen Guarino (I’m Dying Up Here), Willam Belli (RuPaul’s Drag Race), social media superstar Max Emerson, and Traci Lords (Swedish Dicks). It was all made possible from a Kickstarter campaign that raised over a quarter of a million dollars from eager fans. All three seasons of EastSiders have been translated into more than two dozen languages. In addition to Netflix and DVD, the series is available worldwide through WolfeOnDemand.com and Vimeo, as well as through various streaming services in the USA and Canada including Amazon Video, Google Play and iTunes. Kit Williamson is an actor, filmmaker and internet person, best known for playing Ed Gifford on the final two seasons of the AMC series MAD MEN. He created the acclaimed LGBT series EASTSIDERS, which premiered on YouTube and was picked up by Logo for digital distribution and broadcast on the cable channel as a feature film. The Daytime Emmy-nominated series was then released on DVD and VOD platforms through Wolfe Video, and all three seasons are now available worldwide on Netflix. Originally from Jackson, Mississippi, Kit began his career on Broadway in the Tony-Nominated revival of Talk Radio while attending Fordham University. He received his MFA in playwriting from UCLA. Kit is the founder and owner of Go Team Entertainment, a branded content production company and consulting firm which has produced video content for Pride Media, Austrian Airlines, The Vienna Tourist Board, MGM Resorts, Key West Tourism, Harper Collins and Broadway shows. He is also the founder of Brooklyn Web Fest, a new media film festival and content creator conference, and the popular gay travel and lifestyle blog Where Gentlemen Go. Follow him on Instagram and Twitter @KitWilliamson. Founded in 1985 and now celebrating over 30 years as the largest exclusive distributor of lesbian, gay, bi and transgender (LGBT) films, Wolfe Video has released some of the most popular LGBT films of 2017, including Akron; Paris 05:59: Théo & Hugo; Cherry Pop and Heartland. Over the last decade, Wolfe Video has partnered with the most creative voices in the global LGBT film community to bring memorable films to general audiences including the feature debut of Bianca del Rio in Hurricane Bianca; Katherine Brooks’ romantic drama Loving Annabelle and Steven Williford and Paul Marcarelli’s The Green starring Jason Butler Harner and Cheyenne Jackson. Upcoming releases include A Date for Mad Mary; Princess Cyd; Just Charlie; and Sebastian. Wolfe’s library of beloved modern classics includes such acclaimed hits as Reaching For The Moon, Cloudburst, Undertow, and Big Eden. Wolfe’s complete motion picture library can be found at WolfeVideo.com as well as at national and digital retailers such as Amazon, Comcast, Charter, Hulu, iTunes, Netflix and WolfeOnDemand.com. Previous: Win a Troye Sivan “My My My!” remix CD! Next: Win Expectations from Hayley Kiyoko!